Italiae Regiones IIII V VI VII VIII VIIII X XI. 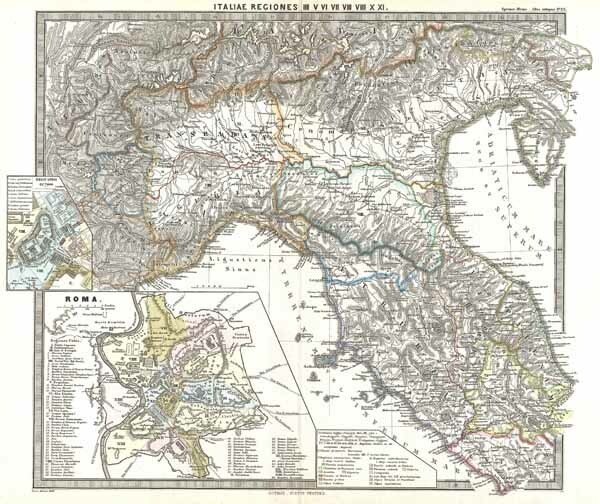 A particularly interesting map, this is Karl von Spruner's 1865 rendering of Northern Italy and Rome in antiquity. This map covers northern Italy from modern day Venetia south as far as Rome and west to modern day Piedmont. Like most of Spruner's work this example overlays ancient political geographies on relatively contemporary physical geographies, thus identifying the sites of forgotten towns and villages, the movements of armies, and the disposition of lands in the region. This particular example includes ancient names for many important regions and sites. Additionally, two inset maps are offered in the lower left quadrant. The larger of the two insets is a city plan of Rome including the ancient city walls and an elaborate key identifying some 62 historic sites. The smaller of the two insets details the Palace of Octavius, 'Region Urbis Octava' As a whole the map labels important cities, rivers, mountain ranges and other minor topographical detail. Territories and countries outlined in color. The whole is rendered in finely engraved detail exhibiting the fine craftsmanship for which the Perthes firm is known. Rumsey 1626.020. Phillips (atlases) 3288. Espenhorst, J., Petermann's Planet, p. 397-404. Espenhorst, J., Andree, Stieler, Meyer & Co., p. 148.